Car sales surged 21.8 per cent in October, 12th consecutive month of growth, as robust festive season purchases brought much needed cheer to the auto industry. 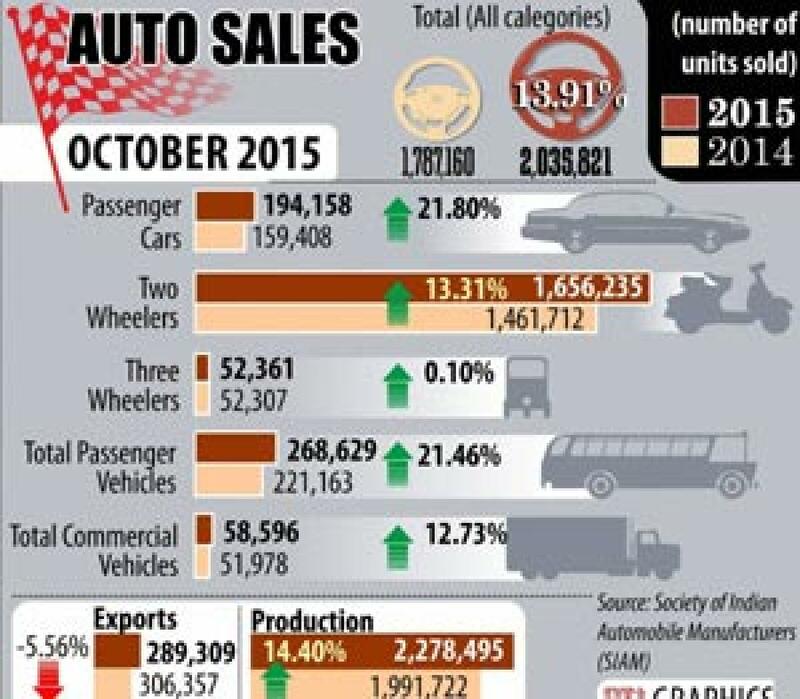 New Delhi : Car sales surged 21.8 per cent in October, 12th consecutive month of growth, as robust festive season purchases brought much needed cheer to the auto industry. According to the data released by Society of Indian Automobile Manufacturers (SIAM), domestic car sales in October this year stood at 1,94,158 units as compared to 1,59,408 units in the same month of 2014.Overall passenger vehicle sales during the month grew by 21.46 per cent at 2,68,629 units as against 2,21,163 units in the year-ago month. "Festival season has brought in cheer to the auto industry as sales have risen across categories during the last month," SIAM Director General Vishnu Mathur told reporters here. Various segments, including passenger cars, motorcycles, scooters and commercial vehicles posted good growth during the month, he added. Commenting on the overall festive season sales, Mathur said: "There is still some data to come for the last month but taking into account the figures so far, this festival season is going to be much better than the corresponding one." During the month, market leader Maruti Suzuki India posted a growth of 21.54 per cent in its domestic car sales at 97,951 units as against 80,589 units in the same month last year. Passenger vehicles sales of the company grew by 24.72 per cent at 1,21,063 units with new products like Ertiga and S-Cross also contributing good numbers. Rival Hyundai Motor India saw its car sales increase by 4.78 per cent to 39,709 units as against 37,894 units in the year-ago month.